regia5 is an Italian manager from Lombardia, seasons 32 and 33 Coppa Italia champion with his club. After the double victory in national cup he has also started an career as national team coach, elected in Cambodia, Norway, Italy, India. 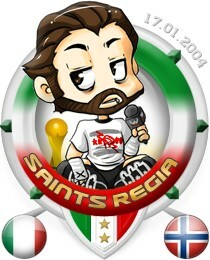 He leaded Norway to World cup (28-11-2010) and Italy to Under 20 World cup (30-10-2011). Since the introduction, he is steadily in the list of world top 10 achievements collectors. regia5 founded the Stamina Trainer International Federation and trained stamina for more than 3 seasons eluding the market crisis and continue earning money. He showed up all of his skills winning twice the national cup with a low cost club, generating an economical success not spending money (the club started season with about 20M euros and ended it with the same amount). On November 2007 he became coach of Kampuchea NT and in March 2008 he as well became coach of Kampuchea U20, with the 100% of the votes. He touched the sky when on 30th May 2008 he gained the first historical win in official matches for Kampuchea against Panamà (match id (170917499)). It was the highest achievement of his career, "more than winning two cups!" he says. On the beginning of Season 36 he was also a runner-up for the his Country NT election: he loses despite gaining 2092 votes (with so many votes he would have easily won everywhere else around the world!) with a crazy and humorous campaing builded on Youtube clips, criticizing his main opponent and former NT coach. He was then reconfirmed as U20 Kampuchea coach the season after. Starting with the team ranked worst in the world, 15 points in qualification group 16 was a great results, beaten only 2 times (both against Portugal), and undefeated by the great Israel team. Notice that after WC ended the new ranking was 74 of 124! Next season regia5 finally won Italia NT election as the coach who beated three months before just failed to reach some result. Unfortunately that was not the right time, failing qualification in Group 2. But compensation came quickly: elected in Norway he lead NT to an incredible and unexpected victory in World_Cup_XV against much better nations. Ironically he contributed in round IV to elimination of Italy, running for a possible first medal. Back to Italy he took the lead of U-20 for a long time, winning U-20 World Cup XVI and place 3rd the next season. At this point is time for regia5 to try a new adventure with little U-20 India. Climbing the ladder 15-01-2007 50 pts Team was ranked amongst the top 50. I want you 06-12-2006 10 pts Bought player. Get out of here 30-11-2006 10 pts Sold player. Practice makes perfect 07-12-2006 10 pts Player's skill increased. Play the Lottery 02-12-2006 10 pts Scouted a new player. Let's do it again 17-04-2007 10 pts Rebought a former youth player. I want you back 05-03-2007 10 pts Sold a rebought youth player. Cup Heroes 26-06-2007 65 pts Advanced from round 14 in the Cup. All that skill 02-05-2009 80 pts Total TSI exceeded of the squad 2 000 000. We’re so loved 18-02-2008 30 pts Fan club size exceeded 3 000 members. Eternal life 31-03-2009 15 pts Promoted player to Hall Of Fame. Investment return 27-05-2009 10 pts Sold a youth player. Met Bob at the bank - 0 pts Bought 0 bonds at Banque Sunesson. Friends from abroad 01-12-2006 10 pts Played international friendly match. Star collector 19-06-2007 60 pts Team reached at least 100 stars in a match. Veteran lineup 21-07-2007 35 pts The average age of your starting lineup is over 35. Stop the press 09-12-2006 10 pts Wrote a press announcement. World needs to know 28-11-2006 10 pts Wrote a forum post. National hero 14-11-2007 50 pts Elected coach of national team. Headmaster of nation 04-03-2008 35 pts Elected coach of U-20 national team. received more than 500 members. Nasty squad 29-05-2010 15 pts The average player personality in your squad is close to nasty. Honest squad 29-05-2010 15 pts The average player personality in your squad is close to righteous. Nice squad 22-05-2010 15 pts The average player personality in your squad is close to popular. Dishonest Squad 22-05-2010 15 pts The average player personality in your squad is close to infamous. This page was last edited on 29 July 2015, at 20:42.